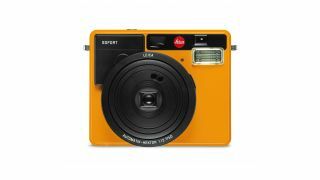 Leica, the camera brand famed for it's high-end rangerfinder and medium format cameras, has launched an instant camera. The Sofort (sofort means instant if German is a little rusty) is Leica's first foray into this area of photograhpy, which at the moment is dominated by Fuji's Instax range of instant cameras. Interestingly, the dimensions and layout of the Sofort look very similar to Fuji's Instax Mini 90. Featuring a fixed lens equivalent to 34mm with a maximum aperture of f/12.7, the Sofort features a host of shooting modes: Macro, Bulb, Auto, Self timer, Party and People, Sport and Action, Double Exposure and Selfie. Leica reckons the Sofort will resist using the built-in flash until light levels make it necessary to do so, while it can be completely disabled should you wish. As well as this, focusing distance can be set independently from the shooting mode you use. Designed by Leica's design team in Germany, the retro-modern design is available in a choice of three colors: black, silver and white, with the camera priced at £215 - US pricing is still to be confirmed. An instant camera needs film, and Leica are announcing both color and monochrome film options, so for those who like to shoot black and white, they can pretend to be just like Henri Cartier-Bresson with the Sofort. Film will be available in packs of 10 - £9.50 for color and £11 for mono, (color film will be offered in double packs as well - £15.50), while it wouldn't be a Leica camera without a host of accessories available for it as well, including neck straps and carry cases.